3. National Merit Scholarship (1984-1989), Bihar, India. Dr. Sudhir Ranjan is a specialist in the area of synthetic chemistry with expertise ranging from low temperature (-78 degree C) reactions to high-temperature (1500 degree C) processes and manipulations. 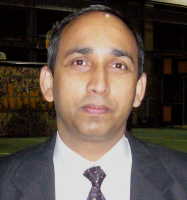 With more than 15 years of experience in research and in solving problems using variety of scientific techniques, his skills are multi-disciplinary and embody specific areas of Inorganic Chemistry, Organometallic Chemistry, Photo-chemistry, Materials Chemistry and Nano-Chemistry. Range of syntheses maneuvering extend from photosensitizers for solar energy conversion to new process development of Silicon wafering for Solar cells, detouring to various other synthesis of precursors in view of their application in various molecular electronic devices and CO2 reduction. He was assigned to lead a feasibility study project on "Tubular form TiO2 nanofiber and its use for the solar-capacitor". With such humungous background, he was entrusted to co-author a book entitled "Light, Water, Hydrogen: The Solar Generation of Hydrogen by Water Photoelectrolysis" (Springer Publication, 2008), [http://www.springer.com/engineering/power+engineering/book/978-0-387-33198-0?detailsPage=toc] which is his one of the major achievements as an inter-disciplinary scientist. Founded on his background as a chemist, his ambitions is, firstly, to develop a novel high-temperature casting process of making a single-crystalline Silicon sheet (or wafer) continuously. Secondly, he aspires to develop TiO2 (or other) nano-structured based self-assembled systems (e.g. photoanodes) having desired location of different functionalities, and subsequent use of these systems for different energy related modern challenges such as solar cells and solar hydrogen production/storage. Dr. Sudhir Ranjan�s scientific activity is well documented in the peer reviewed international journals as well as conferences. He is an active member of American Chemical Society and has enrolled to ACS member network to raise the concerns for the promotion of science for society.